This entry was posted on January 9, 2015 by David Tetlow. Nike plan to release 'Back to the Future 2' shoes later this year. In the popular Sci-Fi trilogy, the second film features Marty McFly travelling to 2015 which iconically had hoverboards and self-lacing trainers. Nike have planned to released the high top trainers featured in the film this year. The main design will remain the same main colour scheme of grey and white but will feature more updated technology that the 80s didn't think of - LEDs. The LEDs are embedded in the soles and heels which you can see in the picture and the Nike tick on the strap lights up too. The LEDs are battery powered and last for 5 hours between charges. 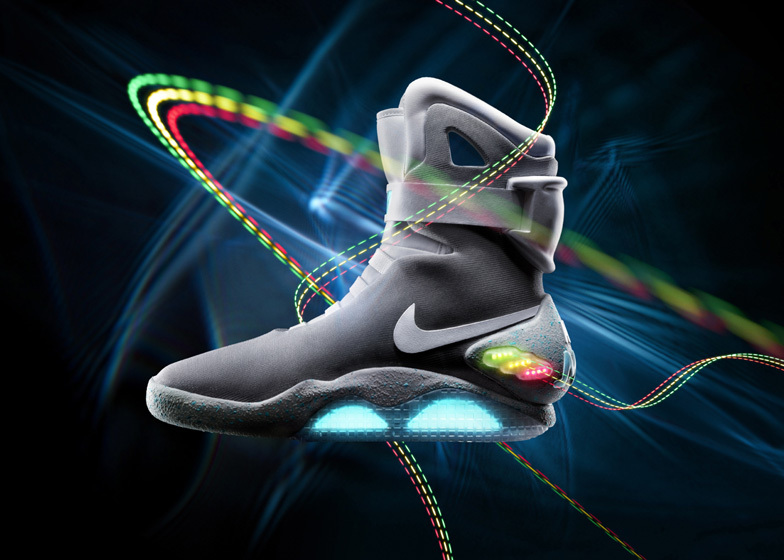 The Nike LED shoes were released in 2011, without the self-lacing technology, on ebay. Only 1,500 were made and the money raised went to charity. Amazingly, hoverboards have also been invented, with a bright light on the bottom making it look more futuristic, and both them and the trainers are due to be released this year. I suppose this film shows that while some technology is predictable - lighting technology isn't.